We had a wonderful holiday weekend! It's pretty much over for us, as it was back to work for Dan today. But, we had a great time Saturday & Sunday. You just can't beat good times with family and friends! Saturday and Sunday, Dan helped our buddy Tom build a dog pen and do some other stuff out at his folks' house. The kiddos went along and helped out as best they could. It sounds like they got quite a bit accomplished. I stayed home and worked here at the house. Tom had promised them a dip in the lake in return for their help, but Saturday it was just too packed and yesterday we had storms roll in. He felt bad about not letting them hit the water, so he bought them a kiddie pool. 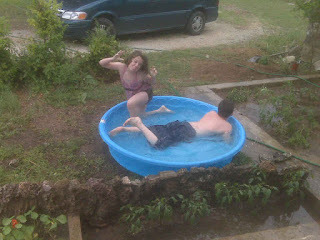 Yes, they are a bit big for a kiddie pool, but they had a blast! They got to splash around in there until the storms hit here in town, then they were done for the day. The rest of the evening was spent enjoying great food and good conversation. Thomas joined us from across the street and we all just hung out and had fun. The evening ended with the kids in bed, while Dan and I cuddled on the couch and watched an Eagles concert. It was a great way to end a really nice weekend! What did y'all do this holiday weekend? Love that picture you posted! I could see my kids doing that.